The first thing we wanted to do in our new backyard was get our little man a swing. Our trees aren’t quite big enough so we are using our pergola over our back patio. Noah loves the swing. We use a very large one at our therapy sessions, and Noah has seen his fair share of swings in other people’s backyards. We have been waiting patiently to have a swing of our very own and today is the day. My favorite part of swinging is Noah’s laugh. He does it every time he gets in the swing, and I can’t get enough of it. He just giggles away like he is having the best time ever. The laugh also encourages us to keep pushing to continue the fun. He has trained us well. Think swings are just for fun? Think again. We didn’t buy this swing for any other purpose but for Noah (and us) to have fun. 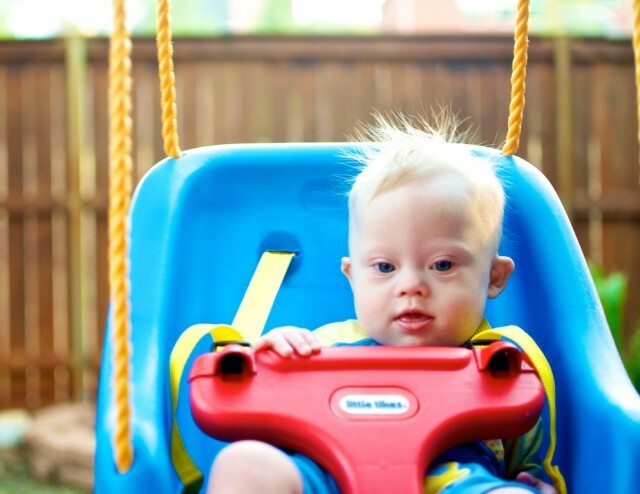 However there are some great side benefits to swinging, not only for children with Down syndrome, but for all kids. We will often start our occupational therapy sessions with swinging as it helps wake up Noah’s muscles and get him to activate his core. The movement forces him to engage his core to keep him sitting up. It helps him be aware of his body and the different movements he needs to make to maintain his balance. Swinging helps with sensory integration. Two sensing systems we have (and no I am not just talking about taste, touch, smell, hearing, sight) are our vestibular system and proprioception. All of our systems intertwine so we can move with ease and experience our environment. These two senses are vital to be able to do this. Our vestibular system is in our inner ear and helps us know if we are moving and which direction we are going. It is essential to balance. It is the reason we get motion sickness or feel like the room is spinning if you are every diagnosed with vertigo. We actually have three loops in our inner ear and the direction of the fluid inside tells our brain how we are moving. God’s design always blows me away. If you apply this to swinging, you are moving in multiple directions and having to balance on the seat, all integrating our vestibular system to figure out what in the world is going on. Proprioception is our sense of knowing our body and where our different parts are located in relation to each other and how they are moving. It can be described as body awareness. There are constant messages being sent from our peripheral body (through proprioceptors and nerves) to our brain and ears telling them where these parts are located and what they are doing. Again apply this to swinging, and the body has to figure out where you are in space and how to control a moving object. Movement involves so many different messages from our body and swinging is just one tool used to help our little guys figure out how to interpret those messages and use their bodies to the best of their ability. Have you discovered any “hidden” benefits of using your child’s favorite toys or activities. Love reading your blog! I AMA teacher of special needs students at the high school level. I am teaching two students with Downs Syndrome, a male and a female. K is 19, and very quiet. She knows all her states and capitals, can read really well, but struggles with comprehension. Verbally, she is pretty easy to understand, but isn't very proactive with speaking freely, nor using long sentences. D is 17, very outgoing, difficult to understand, but has wonderful gross motor. I think parenting played a big part in the development of these two students. Wonder what I would have done differently, if these students had been my own children. Like you, I would have treated them like nothing was different. I have wonderful students, and I'm a tough teacher, always striving to get my students to be independent thinkers and doers. Wish I could get all my parents on board with the same thinking…. OMG, I can actually post now!! Annette Copher Oviedo Wow, it sounds like you are a great teacher! I hope Noah has teachers like you when he is in school! Are are you located? By the way, I'm glad you can post also…where you having problems before? All I know about the swing is that when Caitlin was a couple of weeks old, we put her in one. She was a crier, but if I put the swing on high, she fall asleep or just sit there, I was worried she might get hurt/shaken. When I lowered it, she cry all over again. Needless to say, we left in on high. It was the handcrank type, so we'd sleep for 30 mins, crank, and sleep again! Veronica Navarro I can't wait to. I know he will really like it. Veronica Navarro That would be awesome! Do you still live near San Fran? 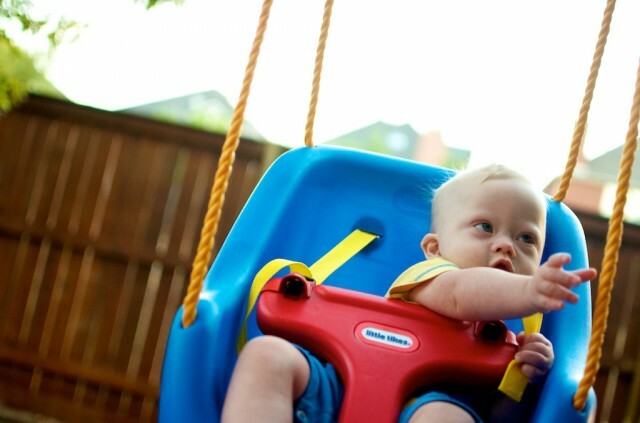 I'm interested to hear how many other children are using a swing in their OT / PT development. Used to have a swing in my classroom, but admin wasn't sure if it was installed safely, so they had me take it down. It was there when I arrived. Annette Copher Oviedo Wow…a swing in the classroom? Sounds like an awesome classroom! Yep, we use a swing like the ones I've seen in your videos. And we have a swing outside at our house that James LOVES. Wonderful post about sensory integration! I am a middle school teacher for medically fragile students, and I am thankful that our school is equipped with indoor and outdoor swings-hammock swings, wheelchair swings, and etc. I will have to get my kids swinging tomorrow. Noah is adorable, thanks for sharing! Thanks for the kind words! Middle school teachers are awesome by the way! I do a lot of work w/ middle school students. Your classroom sounds awesome. Do you teach in public school system? We did a lot of swinging and rocking when Eric was an infant and toddler and I truly believe it is a huge reason as to why he is so verbal. Eric’s speech therapist educated me on the importance of rocking an infant and how that stimulates the inner ear and how that contributes to speech and language development as you explained so well! My son is now 25 and I LOVE your site and pics. Brings back so many wonderful memories of when Eric was a baby! Looking back I did so much for him at such a young age as a mom! I was a whole 20 years old. Keep up the great work! Thanks for your comment. Eric sounds like a great guy! What’s he up to these days? Fantastic post. It makes me want to install a swing in my doorway because it is so cold outside here. I remember my first 2 girls laughing so much in the swing!!! You should! What type of swings have you seen that work well in the doorway? I don’t think I’ve seen any before. I never knew about the swing. I can’t wait to try it once the weather gets a little (I mean alot) warmer here in Michigan! My daughter, Kara-16 months, loves a mirror. I have a full-length one in my room, and I can set her in front of it, and it will keep her entertained forever. She talks to herself, waves at herself, raises both hands over her head and twists back and forth. Her interaction with that baby she sees in the mirror is wonderful. I love to sit and watch her. Oh….yah mirrors are awesome! Noah really likes looking in a mirror also. And…he is also starting to wave! It’s so much fun watching him take each little step. I loved hearing Noah's little giggles too! This was such a great post! I really wish it wasn't so cold and snow covered out side! We have a whole Little Tikes village in our back yard! I went a little crazy last summer. I knew it would all benefit Sydney for therapy reasons! Syd giggles just like this in her swing! Pushing my babies in their swings is one of my favorite things to do on a nice day! I know, his giggles are awesome. I love hearing them also. Rick Smith Maybe I should tell my hubby we need to move to Texas! I do not like the cold weather at all. Melanie Postich Ward I can't wait to see a picture of it! 🙂 By the way, one thing you should know about Texas….the summers are HOT! 🙂 This summer we several days in a row that are over 110! Can you believe that…..! Love this, my daughter is senory intergration too. How old is your daughter by the way? We live in texas too!! Dave N Maggie Krantz When you say hard finding help, what do you mean? Support system? Friends? Family? Also we're in Dallas, what part of Texas are you guys from? NoahsDad.com , financially hard, to go from a doctor/pedi to either TSRH or where ever they can be seen for help OT wise. Its expensive. we are in the New Boston area. Rick Smith Texas Scottish Rite in Dallas. Its by Texarkana. Right in the corner by Arkansas. Thanks Rick, they are great kids! Yes, public school in Michigan. Do you have any other children besides your 14 year old? Dear Noah: You have Mommy and Daddy right where you want them! You will go far in life, Young Jedi, the force is strong in you! You have the most infectious giggle EVER! Thanks for getting me going, I think I may have woken my son with my laughing. On another note, it is always a good day when I learn a new word, and you did that today with "proprioceptive"! Would the fact that I am a lifelong klutz be best described as having horrible proprioceptors, LOL? Thanks! Wow, that baby play ground sounds awesome. You guys should take a picture / video of it! 🙂 I want to see. How do you like this comment system by the way, is it pretty easy to use? This comment system is easy to use. The only problem I’ve found is that I don’t get notified if someone has replied to my comment … do you know how I’d do that? When you leave a comment there should be a little box that says “subscribe to comments.” Do you see that? I like how you example the swing.. there are play toy that really a big help for child development. I guess swing is highly recommend in the same cases. Thanks, Noah really does like it a lot! What sort of toys (big or small) have you tried? What have you liked, not liked, etc? What a beautiful voice, it actually reminds me of James! I can't wait to get one for James. My 8 year old and I spent hours in the swing and singing. It was the only thing that kept him happy his first summer! Rick Smith , as soon as we get some spring weather. We have not had much snow but it is cold. A swing is on my list as one of his bday presents in April! Hey thanks! right back at you! Do you guys have any awesome valentine day plans? I am a pediatric OT so reading this makes my heart smile! Noah is such a precious boy. Hey thanks! Where are you an OT at? Thanks for writing this. I have been seeing swings at PT but we never use them. My baby is only 4 months. I saw some platform swings on line. I made one modeled after those tonight. I added a 6 inch lip around it so he can lay on it and not roll off. I used my wife's yoga mat as a pad. I also made sure it was large enough to fit his car seat. The paint is drying on it now but later this week I will mount it in the house. Thanks so much for the idea. No problem. It sounds like you guys are doing a great job. What is your son's name? And where are you guys from? Rick Smith our sons name is Jax. We live in Atlanta. He is amazing. Another awesome post. Our oldest has some sensory integration issues and our youngest with Ds has displayed a few as well. I knew that he loved to swing, but now we will have another excuse to do so when the weather warms up. Too much snow in NE to play outside. Is there an indoor system that Ben could fit into/use? What about using a "Johnny Jump-Up," but attaching it higher off the ground? Wow – I have been dying to get Enzo on one of the park swings in our neighborhood. I am going to have to try it tonight. This will be so much fun. I am just so concerned that he is so little and might slide off or something, but I’ll make sure it works. Noah’s laugh is just too cute and contagious. Love hearing his laugh too! Thanks for sharing. I love the swing. We can’t wait to get Enzo on a swing. Noah looks so stinking cute on the swing. Thank you both for sharing your love for Noah. You are educating us all on how to be encouraging all children develop. Thank you all so for sharing your faith and walk in being the parent of your darling child, Noah. Do these principles apply to indoor swings that the kid is strapped into and it swings on its own (with the help of batteries). 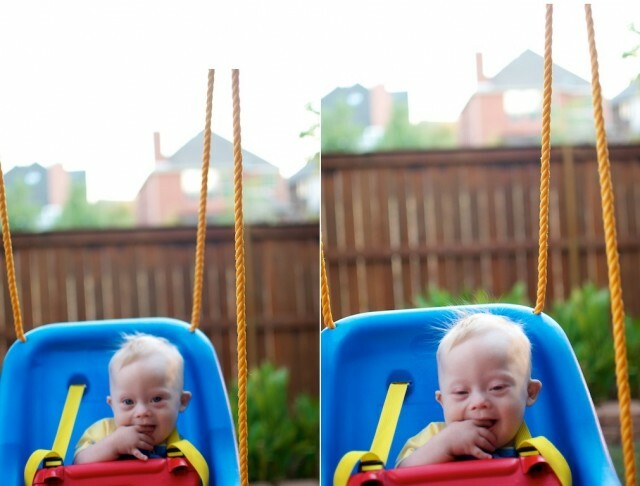 he is so cute and happy in that swing. my nine month old also loves the swing. and his hair sticks up just like noah’s hair! so adorable! Thanks! And it sounds like you guys have a ton of fun. Where are you from?